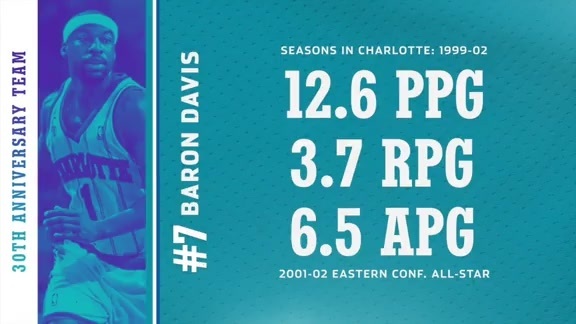 A popular, high-flying fan favorite, point guard Baron Davis was known for his electrifying play and athleticism during his first three NBA seasons in Charlotte. 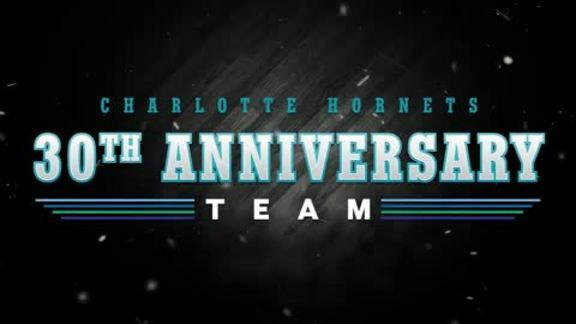 Holding a less than 1.0 percent chance of winning the 1999 NBA Draft lottery, the Hornets unexpectedly slipped into top-3 positioning behind the Chicago Bulls and Vancouver Grizzlies. The organization grabbed the sophomore Davis out of UCLA, who had just recently been named a Third-Team AP All-American. As a rookie, Davis put up modest numbers playing primarily behind veterans Eddie Jones and David Wesley. He quickly emerged as a do-it-all threat his second season though, posting averages of 13.8 points, 5.0 rebounds, 7.3 assists and 2.1 steals in 82 starts. Davis’ 20.3 points, 4.7 rebounds, 5.0 assists and 3.0 steals, the Hornets dominated the Heat, 3-0, in the opening series for their only postseason sweep in franchise history. The following round, Charlotte made it to the brink of its first-ever Eastern Conference Finals, before falling to the Milwaukee Bucks in seven games. Even on the bigger stage, Davis’ versatility was on full display as he rapidly solidified himself as one of the game’s brightest young stars. In Davis’ final year in Charlotte, he registered marks of 18.1 points, 4.3 rebounds, 8.5 assists and 2.1 steals in 82 regular season starts, picking up the first of his two career NBA All-Star Game nominations and another second-round playoff finish. Davis was part of the original Hornets squad that relocated to New Orleans at the conclusion of the 2001-02 NBA season. Still just 23 years old at the time, Davis played another 10 NBA seasons with the Hornets, Golden State Warriors, Los Angeles Clippers and New York Knicks. He made the 2004 All-Star Game, won the Skills Challenge and finished the season on the All-NBA Third Team. Davis led the league in steals twice (2004, 2007) before retiring in 2012 after suffering a severe knee injury while playing for the Knicks. In total, Davis averaged 12.6 points on 42.1 percent shooting, 3.7 rebounds, 6.5 assists and 1.8 steals, while never once missing a regular season or playoff game in Charlotte. He ranks fifth on the franchise’s all-time assists leaderboard (1,605), seventh in steals (439), third in career assists per game (6.5) and fourth in career steals per game (1.8). Davis attempted a comeback in 2016 and played six games for the then NBA D-League’s Delaware 87ers. This past summer, he competed in the BIG3 Basketball League and currently works as a studio analyst for The NBA on TNT.